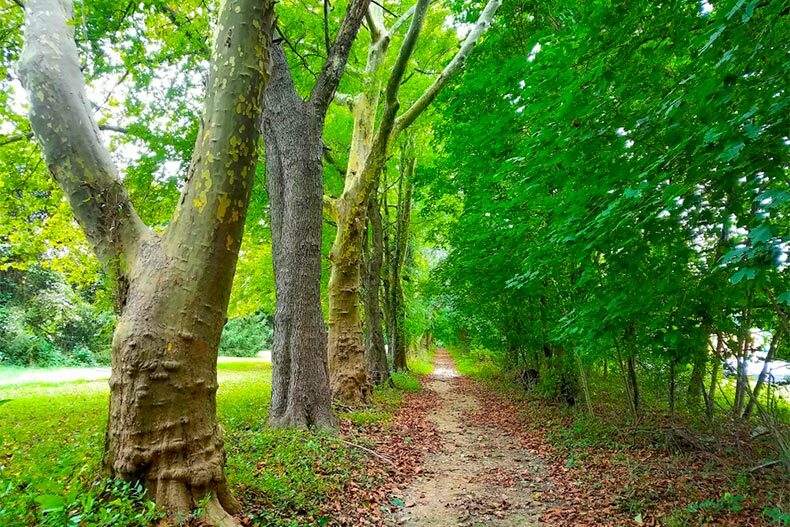 Explore Delaware's many green spaces while living in Heritage Shores. Located in Southern Delaware, Heritage Shores offers a country club experience for the active adult golf enthusiast. As one of the largest 55+ communities in Delaware, the amenities don’t just end with the golf course. They also include a clubhouse with ballroom, a wellness center, and live entertainment at the Sugar Beet Market every weekend. When it comes to housing styles, active adults have plenty of options in Heritage Shores. Opened in 2004, the community currently has about 1,800 homes that range in style, size, and price, and new homes are still being built. Providence of Brookfield (also known as Brookfield Residential) has built the largest number of homes, which range from two to three bedrooms. Ryan Homes offers some slightly larger models, with two to four bedrooms. Some Lennar Homes models are also available by resale. You can find both single-family and duplex models. All of the homes range in price from the mid $200s to the mid $300s and include an attached garage. The biggest attraction to Heritage Shores might be the 18-hole course designed by Arthur Hills. Voted the Best in State by Golf Digest in 2015, the links are playable yet challenging for all skill levels. All of the amenities in the community encourage an active lifestyle. The grounds of the course and community provide plenty of places to walk and bike. Next to the golf course is the clubhouse, where the full-time activities director puts together classes and social events throughout the week. Find time to create in the woodshop or arts and crafts room, or enjoy quiet time in the library and computer center. The Wellness Center has an indoor and outdoor pool, a fitness center, a dance and aerobics studio, tennis courts, and pickleball courts. The Sugar Beet Market, overlooking one of the many small lakes in the community, is a great place to meet and eat. The restaurant serves lunch and dinner from Thursday through Monday and is home to live music on the weekends, plus special events and community appreciation nights. In the middle of the Delmarva Peninsula, Heritage Shores is a scenic community surrounded by beaches, small towns, and cultural sites. Just an hour east of Bridgeville, you’ll find beaches and boardwalks, and even the ferry that takes you to scenic Cape May, New Jersey. Venture into Maryland and you’ll find the historic towns of Salisbury, Easton, and Cambridge. The peninsula is also home to a number of parks and visitor centers, from the newly-opened Harriet Tubman Underground Railroad National Historic Park to Assateague Island National Seashore and Chincoteague Island, to Bombay Hook and Blackwater National Wildlife Refuges, both great spots for bird watching. Heritage Shores is also just an hour-and-a-half south of Wilmington, Delaware and about two hours from Washington, D.C. and Baltimore if you want to visit the city for a weekend.